January 27, 2011 Westlake drill swept the competition. Winning 1st in Military, 1st in Dance and 1st in Kick line. Making them the REGION CHAMPS!!!! They beat out Timpview and Lehi. Shawnee here with her Storm friends Brittany and Danielle. Shawnee's supportive friends who came all the way up to Bountiful to watch their friend. They so enjoyed celebrating with her. Thanks for coming Morgan and Ryann. Region Champs! We're number 1. They were so excited. Not only did we take home three plaques and one championship metal we also took 1st and 3rd in the drill down with Sierra Phillips as 3rd and Kamber Hopkins took 1st. Nice jobs ladies. Jumping up and down with excitement that we won 1st in every category. Love how all the girls get nice and close link arms while they wait for their named to be called for 1st place . They were getting pretty creative while they were waiting for the judging to be done. The wave with their legs. Shawnee in the drill down. She didn't last very long but that is ok. She is only a Freshman after all. She was so ready to be done. But it was so worth the wait. Region Champs 2011. Way to go Shawnee you are awesome. Words can not explain how proud I am of you and all of your hard work to get here. Lets go get them at State. Show them what you are made of. Shawnee does an awesome headstand in Military and also does an ariel in her Kick routine. Shawnee made all the team dances this year and she is only a Freshman. Can't wait to see what she will do in the coming years. GO STORM!!!!! Happy 36th Birthday Brad. It was a bummer night for him a little bit. Shawnee had her first ever Storm Night. Storm Night is when the drill team showcases all there routines for the year. So we went to that. Brad did have a yummy dinner of Marinated Turkey, cheese potatoes, baked beans and carrots. After the Storm night we came home to a German chocolate cake and ice cream with opening of presents. The kids were helping wasn't that nice of them. After the girls showcased their dances they had a boy drill down. It is where you have to follow and listen to instructions and move how they tell you. Ty heard boys come on down and he was going. He didn't know what they were doing but he was going to do it. Of course he is front and center. A ten hut. He followed the instructions pretty good but he did get his directions mixed up a little bit. The boys would be one way and he was the other. Parade rest. He lasted the whole time of course. 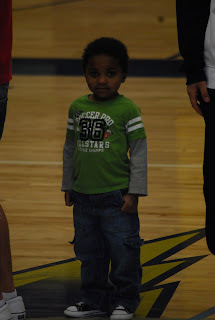 He was the star of the drill down for sure. He was the overall winner. Parade wave and all. :) This kid cracks me up. Shawnee doing her kick line routine "Crazy Train" She does an areal in this dance. Her Dance routine "When Love Takes Over" She is pretty flexible this girl. Military routine "Introduce a Little Anarchy" They all do head stands pretty impressive. Love all the facials that these girls give. Shawnee did an awesome job. Her team has placed high in their routines. They have placed high enough to receive 6 trophies so far this season. They still have Region and State to go to still. What a great group of girls and the coaches are amazing as well. The girls have worked very hard. Go get em STORM. Tyrell Josiah is now 4 years old. I can not believe it. He got to spend his birthday at home this year. We are usually at the cabin but we didn't go down until later this year. So he got to do some things that he hasn't done before. Brad took him to see Yogi Bear the night before and on his birthday we took him to Pirate's Island. He had a ball. All he wanted to do was ride the motorcycle. He of course was to little so I had to steer the bike while he pushed the gas. He was doing flips and jumping off things. He was in heaven. We got home after an hour drive home due to a snow storm that froze the roads. He opened presents and we ate his train cake that he wanted me to make. He of course helped. He got another train car for his train set, a remote control car, an outfit, a drum set and some more trio's. Ty is a loving little guy. He loves all cartoon's. He is in love with trains. He will always say sorry to you even if he didn't do it. He goes to sleep around midnight every night. He is a none stop go go go kind of kid and we wouldn't trade him for anything. Happy birthday little guy. We love you and are so glad you are part of our family forever. We had a wonderful Christmas this year. We were so blessed. The kids got everything they wanted and they were all pleasant after all the presents were opened. I guess Santa is getting better at this Christmas thing. The kids get pajama's from both grandmas. We started the night with stopping at Grandma Turner's house. They gave the kids each a present. We then headed to Grandma and Grandpa Bateman's. We had a yummy dinner and acted out the Nativity. We had donkeys, sheep and a star. Shawnee was the star's pedestal. We then watched a movie called Still, Still, Still. It was amazing. Grandma handed out present to the kids and they opened them. They received pajama's and a warm fleece blanket that the kids all love. We then went to grandma and grandpa Wilson's. 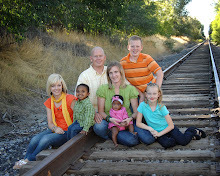 The kids put on their pajama's had pictures taken with the cousins and we went home to wait for Santa. We had a great Christmas. 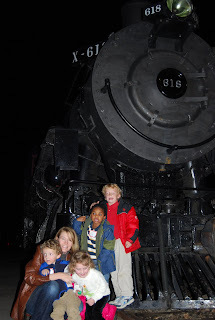 I took Ty on the Heber Polar Express this year. He is so in love with trains. I thought he would have a blast, and sure enough he did. We went with a couple of his friends. Lizzie and Elijah Shawgo. Ty getting off the train after a very fun and enjoyable ride up to the north pole. Ty got to get his picture with Santa on the train. He told him he wanted a train and a scooter for Christmas. You have to have Hot Chocolate on the train. And yummy cookies that Mrs Clause made just for us. We read The Night Before Christmas and sang lots of Christmas songs. Ty loved watching out the window, even though it was a little dark. You could see all the Christmas lights. We had so much fun. The week before Christmas and it finally snowed enough that the kids could play in it before it melted. It was an awesome storm that left at least 6-8 inches and it was wet snow. Perfect for making snowmen. Everyone was bundled but it was warm enough that I was just in my sweatshirt and jeans. 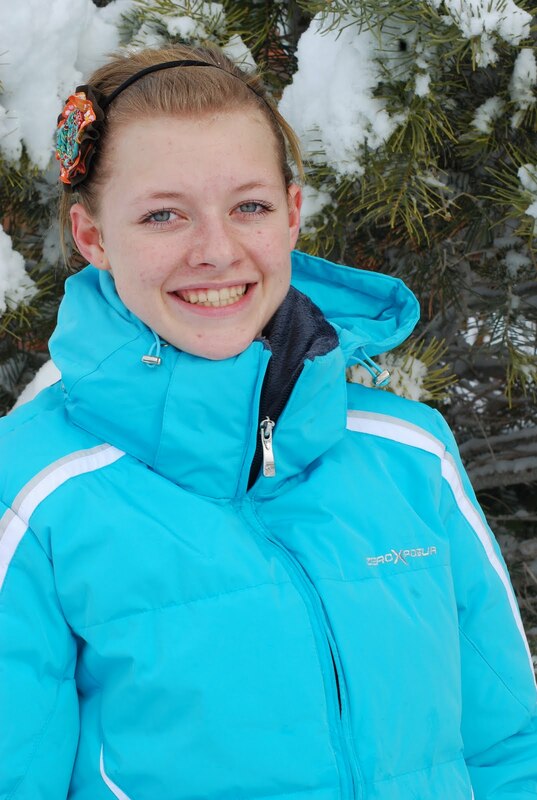 Cortlyn putting on smile with the snow in the tree in the back ground it was so beautiful. 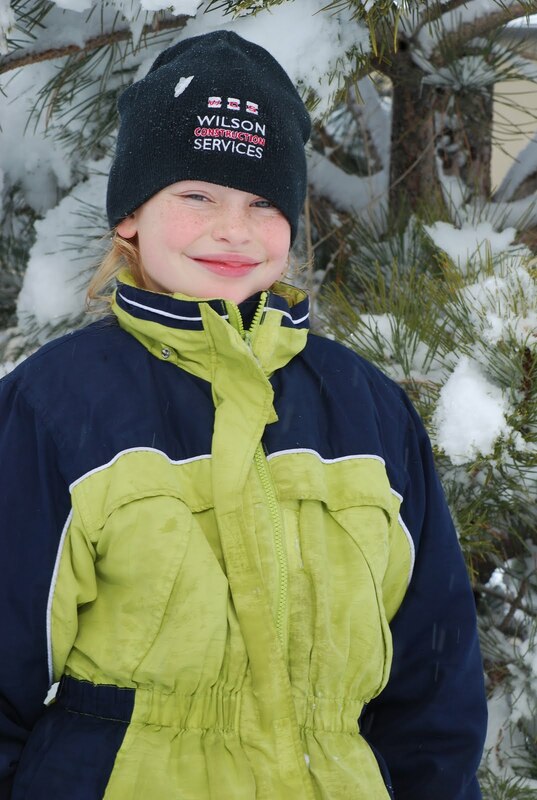 Kenzie was loving the snow. I think she liked the fact that she was just outside. She loves being outdoors. The finished product. Our snow bear. He turned out pretty cute. To bad he only lasted a couple of hours. Here is the newest addition to the family Sammie dog. She is an English bulldog. She likes being outside too. Kenzie also loves being on the fourwheeler. Hayden plowed our driveway. What a good boy! All Ty wanted to do was have a snowball fight. But I had to make the snowball and give it to him. He got the girls pretty good with a little help from mom.